It's not hard to learn meditation for grief and these relaxation techniques will help you to get in touch with your emotions. In times of grief, we need to be able to relax more than ever. It is a very stressful time, it's hard to sleep, we may not be eating well, and there is a lot to do. Even after the initial shock has worn off, as we rebuild our lives, we need to be able to find peace and quiet to work through our troubled emotions. Meditation is a great way to ease grief and these easy relaxation techniques will help you to find inner stillness and strength. In times of turmoil, we need to find a quiet place of relaxation and safety. Relaxation and meditation can be really helpful for this. There is no mystery in these things. Anyone can do it with a little practice. Relaxation and meditation techniques are very good for retraining the mind to think positive thoughts and to stop yourself falling into the self pitying trap. But you can retrain your mind at any time of day or night you don't have to be lying down and have your eyes shut and be listening to music. Just catch yourself when you start to think negative thoughts and try and turn them around. Try to find the positive in every day. Try and find small things to be grateful for. You will find that this habit will lift your spirits in a while and make it easier to cope with your grief. Meditation can also be a good way to calm the mind enough for it to begin to process your grief and face it from a place where you feel safe. Lie on the floor face up with your palms upwards. Cover yourself with a blanket if it's cold. Make sure there is nice subdued lighting. (If you can't reach the floor easily you can do this lying on top of your bed, or sitting comfortably). Put on some music – see here for some suggestions for relaxation and meditation music - something very calm and relaxing. Take a few deep breaths. Fill your abdomen and then your ribs with air. Count three as you breathe in and three as you breathe out. Watch as your breathing becomes slower and more relaxed. After a few minutes of calm relaxed breathing, focus your attention on your toes. Let them be heavy and relaxed. Then focus on your whole feet, let them be heavy and relaxed. Then focus on your ankles, let them be heavy and relaxed. Work slowly through your whole body focusing on each part of your body, letting go of any tension. If there are any pains or tension observe it calmly and move on. Don't forget to pay attention to your ears, your eyes, your jaw and your tongue. Let go of any muscle tension as you find it. Once you have relaxed your whole body you can choose to listen to the music, become the sound and enjoy the wonderful relaxed feeling of your body. Try and let your mind be still. If any obtrusive thoughts come into your mind, observe them, and let them float away. While you have got your body in a relaxed state why not try an easy meditation? I have done yoga on and off for about 30 years, and yoga meditations are simple enough for everyone to do. You can do this lying on the floor or bed, sitting cross legged or just in a chair. Imagine yourself in a beautiful place with a cool breeze blowing gently. You are warm and comfortable and calm. Close your eyes and focus on a beautiful colour behind your eyelids. I usually find purple appears behind my eyelids but you may have another colour or you can imagine a beautiful golden light. Imagine this golden light slowing flooding your whole body with warmth and healing. You could imagine a white light flooding your body and filling every cell with health and happiness. You could hum some long soothing notes on whatever pitch you feel comfortable. Feel the vibrations sending relaxing waves into every part of your body. I accept my grief and I am healing. I am strong and I will get through this. My life is precious and I will treasure every minute of it. Choose whatever words or phrase are meaningful for you at this moment and which will help you to feel more positively about your life and your loss. Don't be surprised if you feel emotions bubbling to the surface once you are relaxed. You might find yourself sobbing, but let it wash over you. It is healing. A guided meditation for grief might be useful if your mind wanders too much. There are plenty to choose from here. They have been developed by grief and hypnotherapy experts to guide you gently through your grieving process. 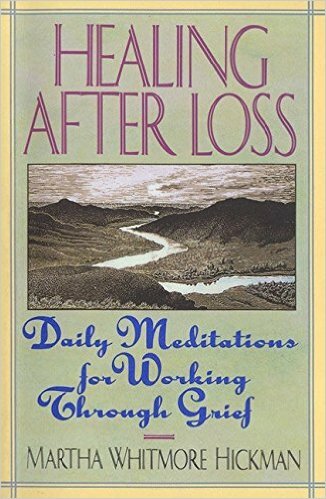 Another way you might prefer to calm the mind is to use a daily meditation from a book. These short inspirational passages can give the mind a beautiful idea to focus upon and to guide you to more positive thoughts about your life and the world around you. Martha Whitmore Hickman has written a book of healing meditations, one for each day, that you can work through. Each one is very short, but deeply felt and uplifting. We wish you a calm and healing grief meditation.